Polyform Boat Fenders are made to protect your boat, even in tough conditions. When deciding on the size and number of fenders, plan for the unexpected and toughest weather conditions. Also consider extra Polyform Boat Fenders in addition to the "basic need". Depending on the shape of the hull, weight of the boat etc, consider a possible mix of cylindrical and / or spherical Polyform Boat Fenders to achieve maximum protection. Important! Do not over-inflate as this will weaken the product and void the warranty! Polyform products are designed to be inflated to 0.15 to 0.20 bar of pressure at 20 degrees Celsius. For use under tropical conditions the pressure has to be reduced to 0.05 to 0.06 bar. When inflating products without a pressure gauge, fill the Polyform Boat Fenders / Buoy until the walls start to expand and make sure that you are able to depress the wall at least a quarter of an inch (approx. 0,65 cm) with light hand pressure, (for tropical conditions: approx. half an inch or approx. 1,5 cm). Do not over inflate as this will weaken the product and voids the warranty! The use of pressure gauge is recommended! Only the lower swivel (under water) shall be used for mooring of the boat. The size of the buoy depends on the weight and the total load it will be exposed to. The dimension of the mooring iron bar and swivel should be chosen in accordance with the size and weight of the boat, weather conditions, the currents and wave height in the area the mooring is intended to be placed. Do not expose the buoy to a load of more than 60% of its total buoyancy. Please also consider additional weight / load caused by marine growth, currents, wind and waves. Do not over-inflate! Over-inflation will seriously weaken the material, destroy the products intended shape, reduce the lifespan of the product and void all warranty. Please remember to check your mooring for wear and tear at least twice a year. If in doubt, ask for professional advise. The flexible all-plastic POLYFORM valve is fitted into every POLYFORM product. V10: During inflation, a flap at the lower end of the valve ensures little or no loss of air. Securing the rigid plastic screw will then close the valve. Securing the rigid plastic screw will then close the valve. V40: Designed for easy pressure regulation and not equipped with any bottom flap. Inflate through the centre hole of the screw. (The screw should not be removed from the valve). Inflate through the centre hole of the screw. (The screw should not be removed from the valve). Vinyl cleaner, mineral spirits or simply soap and water may be used. Stronger chemicals like lacquer thinner or acetone will irreversibly harm the products by breaking down the chemical composition. Waterproof marker pens are widely used, alternatively, special paint for silk-screening on soft PVC may be used. If products are stored for a long period of time, the boxes should be opened and the valves should be opened. 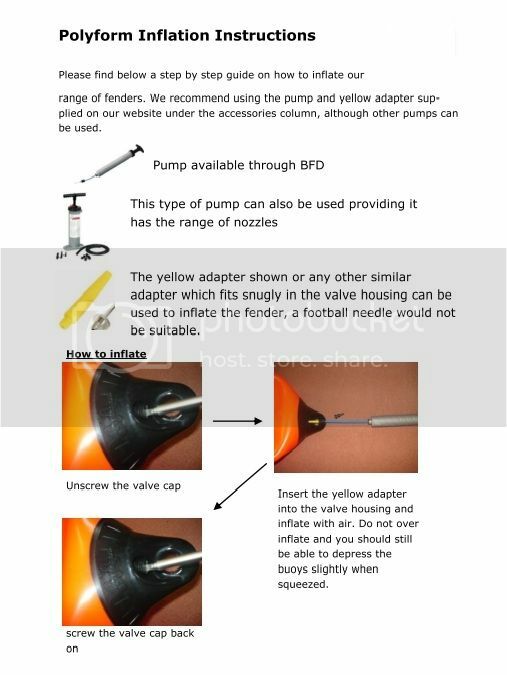 It is also adviseable to inflate the products slightly.